If you are looking to plan a romantic getaway for you and your significant other, Jackson, MS, is the perfect place for you! Experience the charm of this beautiful southern city in a fun and exciting way. Discover the four most romantic places in Jackson, MS, and get ready for a unique weekend! Stroll around quaint parks, dine at some of the finest restaurants in town, explore fascinating museums, and more! Rekindle the flame with these four romantic places in Jackson, MS, and stay at Fairview Inn for an extra dose of magic. Have a lovely weekend with these four romantic places in Jackson, MS, and discover even more activities to do during your stay! Download our free Vacation Guide and get our top recommendations for great outdoor adventures, gourmet restaurants, quaint shops, and fun events. Jackson, MS, has a lot to offer, so don’t wait another minute! Start planning your trip today and get ready to be dazzled. Step into one of Monet’s paintings at the Mynelle Gardens! Walk hand in hand through this lovely garden and explore the blooming pathways and a picturesque bridge over the pond. This hidden gem is the perfect spot for a romantic picnic. There’s nothing more romantic than looking at the night sky in the arms of the one you love, and at the Russell C. Davis Planetarium, you can do that in the middle of the afternoon! Experience the mysterious world of galaxies in the domed multimedia theater. Let your mind wander at the Mississippi Museum of Art. Unwind and admire beautiful paintings and sculptures in a mindblowing modern building. The museum offers a wide variety of exhibitions throughout the year, and the permanent collection showcases artists like George Bellows and William Steene. You’ll also find works from local artist Walter Inglis Anderson and photographer James Patterson. There’s no better way to end the day than with a romantic candlelight dinner, and our authentic bed and breakfast is the perfect place for a magical evening. Start the night sipping delicious cocktails in the Library Lounge. Enjoy a spiced pear cocktail surrounded by classic Mississippi novels and get lost in a Hemingway kind of atmosphere. Continue the evening at our restaurant, 1908 Provisions, and taste delectable entrees. Our personal favorite is the seared redfish, but make sure to try our baked oysters as an appetizer and our white chocolate creme brulee for dessert. We also offer a top-notch wine selection! There are so many other romantic activities you can share with the one you love. Find out everything there is to do in downtown Jackson, MS, and make your weekend getaway the best you’ve ever had. Plus, discover our romantic getaway package that includes a night in one of our luxury suites, a dozen of roses, a bottle of champagne, and more! After spending a lovely day at these romantic places in Jackson, MS, take your better half back to a comfortable room at Fairview Inn. Our luxurious accommodations are ideal for couples and will make you feel like you traveled back in time. Book our Garden Room and relax in the private sun room with a hot cup of tea. 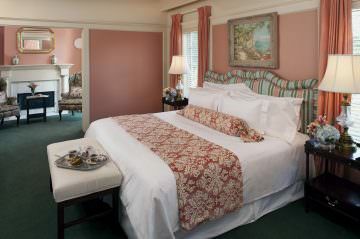 Or, slide in the hot Jacuzzi tub and nestle up by the fireplace before enjoying a good night’s rest in the king size bed. You can even take advantage of our private spa with our exclusive spa packages. Wake up the next morning to a homemade breakfast and get ready for your next Jackson, MS, adventure! Book your stay today and spend the most romantic weekend at Fairview Inn! Why You Need to Spend Your Afternoon at the Jackson Zoo! — Shopping in Greenwood, MS, Is a Local Favorite in the Delta!